This Nativity set was painstakingly hand-molded from bread dough and baked until very hard. This technique originated in Calderón, Ecuador, which is a pueblo just outside of Quito in the Andes Mountains. The tradition of giving these masapan gifts to neighbors began approximately 150 years ago. 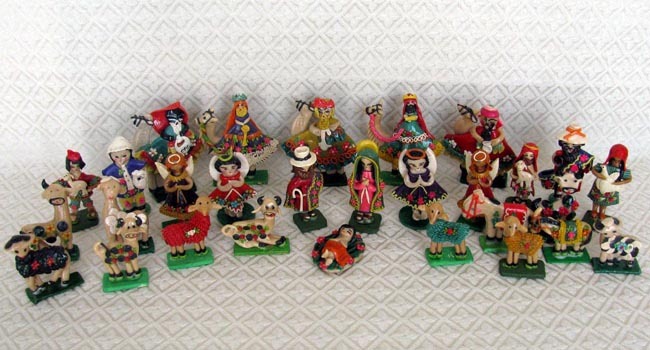 This Nativity scene is a combination of two separate sets that were each missing critical pieces (like Mary and baby Jesus), so this set has an unusual assortment of 29 figures: Joseph, Mary, baby Jesus, four angels, five villagers, six sheep, four cows, two donkeys, and five wise men. Joseph stands 3 inches tall. There are many stores right in a row in Calderón that produce these little figurines out of bread dough. To create this art, the artisans boil the dough in water, add preservatives and bright coloring, and then run it through a pasta maker to ﬂatten. Next they cut the dough, form festive shapes, and put the details together using glue. Finally, they add a ﬁnishing glaze and set the figures out to dry.